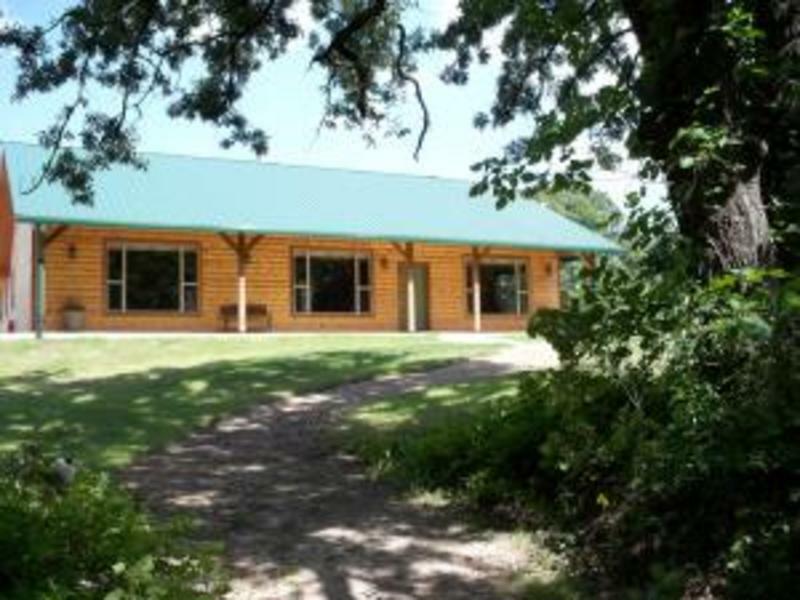 The Treehouse is an all-inclusive, adult Christian retreat facility nestled in the beautiful woods of Southeastern Oklahoma. The house has a spacious, rustic living area with a massive rock fireplace, surrounded by comfortable leather furniture, creating the perfect place for Bible studies and devotions. Complete with a reading library, piano, television, DVD and video library, guests find The Treehouse to be welcoming and peacful. The large, round dining room table enables the retreat guests to enjoy meals, which are prepared and served to them. Five master bedroom suites allow each couple to enjoy their privacy and quiet time with the Lord. Each suite has been named after a tree specie found in the Bible, and the artwork and custom built headboard depict that tree. Also included in each room is a table and chairs, desk, coffee service, full bath with hair dryer and bathroom amenities. The upstairs, multi-purpose loft area is available to be used as a meeting room or as a sleeping loft. Beds and bedding are available upon request. This area has a full bath, refrigerator, coffee service and a balcony overlooking the woods. The Treehouse retreat guests are also able to enjoy the outdoors by spending time on the partially covered patio space and sitting around the firepit in the evening. The "Prayer Trail" offers retreat guests the opportunity to commune with God in His beautiful creation. The five Prayer Stops on the trail provide places to sit, reflect and pray. The "Prayer Trail" leads to the swimming pool area, spacious yard and horseshoe pits. It is our prayer that every person who comes to The Treehouse receive a touch from the Holy Spirit of God. We are blessed by the opportunity to serve Him in this capacity and strive to make every guest feel welcome and special.